I have always been a fan of unicorns since I was a little girl. Lately, I have noticed that there has been a real unicorn trend and you can get all sorts of unicorn themed things. 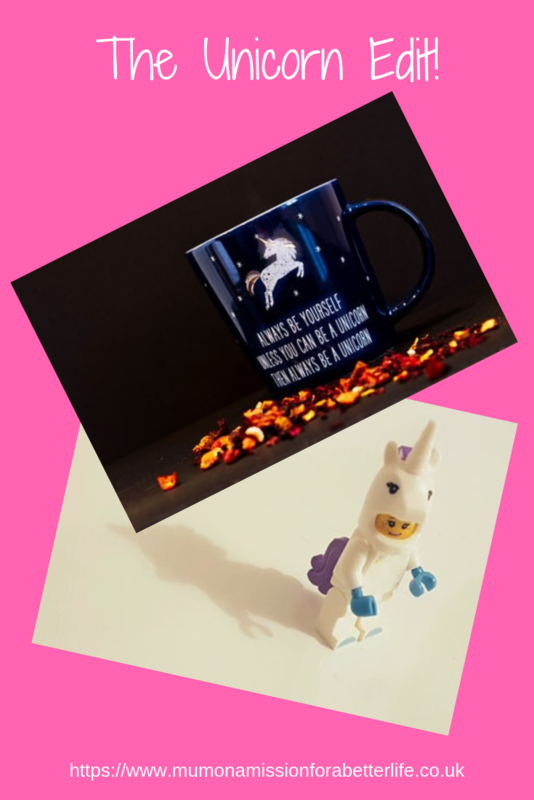 In this post I have put together a collection of unicorn themed items which I have found and like, so if you are a fan or have a unicorn fan to buy for, you have lots of ideas. In this collection, there are kids clothes, kids footwear, adults, bedroom, home, baby, toys and other sections. Some of the photos are not great quality but links have been included for all items so that you can have a better look. This post does include some affiliate links but clicking these links costs you no extra. It just helps me to keep the blog going. This Magical Unicorn Fancy Dress Costume from Asda comes in ages between 2 and 8 years and costs £11 which is pretty good value and really cute! I love this Sequin Unicorn Jumper also from Asda. It comes in a range of sizes up to 14 years and costs £9. This girls grey unicorn sequin sweatshirt from River Island is super cute and available in sizes between 5 – 12 years. This one costs £16. Next have this dark blue denim unicorn embroidered skirt which I really like. It comes in sizes 3 – 16 years and costs between £17 – £22 depending on size. Asda has these adorable iridescent unicorn boots for younger children. They are priced at £14. These unicorn embellished Hi-Top trainers cost between £22 and £28 from Next. They come in a variety of sizes up to a UK size 7. These pink unicorn boots are also from Next and cost between £37 and £43. They are for younger girls and the largest available is a children’s 12. These unicorn wellies look fantastic and come in sizes 6 (infant) to 4 (child) from Sainsbury’s. They cost £10. These unicorn full back slippers are another Asda find. They come in sizes 10 (child) to 4 and are great value at just £6. For those of us who are still young at heart, Asda has this white shimmering unicorn fleece onesie. This is priced at £20 and looks super cosy for the colder nights. These pink unicorn faux fur sliders are from Next and priced at £12. If you love unicorns but are looking for a more subtle way to wear them then these unicorn sparkle trainer socks could be just what you need. They come from New Look and are priced at just £2.49. The Pieridae unicorn duvet set comes from Studio and is priced at; single £12.99, double £19.99 and king £25.99. The magical unicorn duvet cover from Asda comes in both single and double. Priced at £10 or £12. Another Adsa set is this purple unicorn print easy care duvet set which is priced between £10 and £16 depending on size and it comes in four sizes. The pink unicorn print cotton double duvet Set is also available in a single. It comes from New Look and is priced at £19.99. 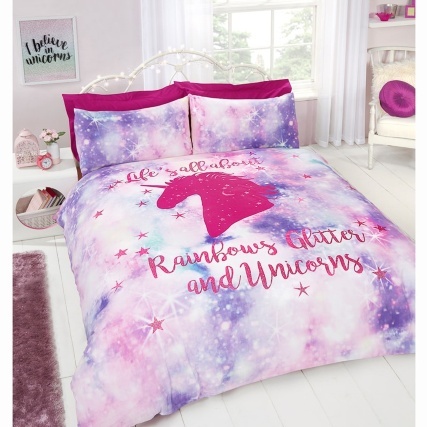 This rainbow unicorn double duvet set is from B and M. It is priced at £16.99 and is also available in a single. These fab magical unicorn wall stickers from Next are so pretty. They are priced at £22. I love this Unicorn Ring Holder priced at £10.99 from Getting Personal. It is rose gold which I love. This cute unicorn trinket dish from next is great for your bedroom or by a sink for when you take off your rings to wash your hands or wash dishes and is only £5. For the real unicorn fans, Asda has a whole tableware range. This unicorn 12 piece dinner set has 4 dinner plates, 4 side plates and 4 bowls and is priced £25. There are also other matching items available such as mugs and pasta bowls. Another Asda find is this unicorn-shaped cookie jar priced at £12. I love this and think that it would look great in any kitchen. 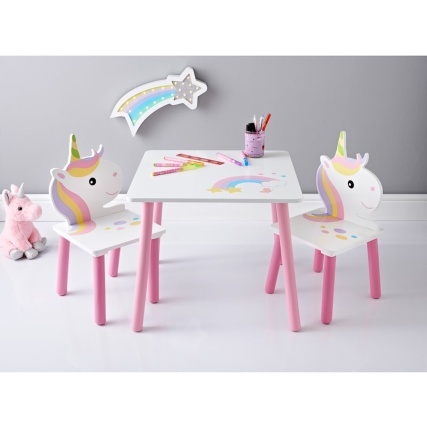 This Unicorn Wooden Table & 2 Chairs from B and M is so cute! It’s priced at £29.99 and is great for little ones. This 3D Hooded Unicorn Blanket is also from B and M and comes in three colours; pink, purple and blue. It is priced at £9.99 and looks really cosy. This unicorn tabletop lamp from Studio is £29.99. It is white and silver and in my opinion, beautiful. This Red kite unicorn play gym is from The Range. I love the colour of this beautiful play gym which is suitable from birth and priced at £19.99. 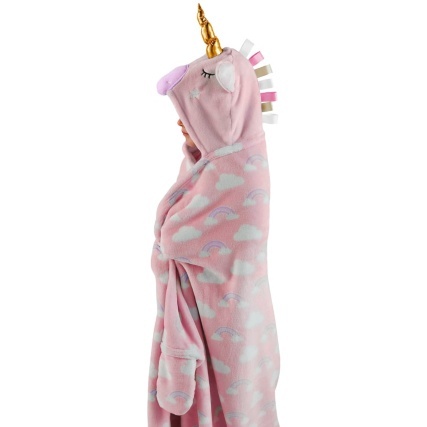 This pink unicorn all-in-one is so sweet and looks really snug too. It comes from Next in sizes 0 – 2 years and is priced £26 – £28. This Unicorn guitar from Studio can be personalised and is a great price at £12.99. Perfect for any budding musicians. I love these type of money tins and this one is a Unicorn Money tin from The Range and only costs £1. This Pitter Patter Pets Walking Unicorn is great fun for the little ones. It is from the Entertainer and priced at £12.50. This Sew Your Own Sock Unicorn also from The Entertainer is great for older children and priced at £5. I love this personalised children’s book – Unicorn Adventure from getting personal. It is £12.99 and your child’s name can be put into the story. This Unicorn magnetic weekly planner from The Range is really sweet and super handy to keep organised. It’s also great value priced at £3.49. When I found this, I knew that I had to include it in this list! An LED unicorn Christmas decoration from Studio. This is so cute and good value at £29.99. This black unicorn print 2 wheel holdall is from New Look and costs £29.99. Phew! 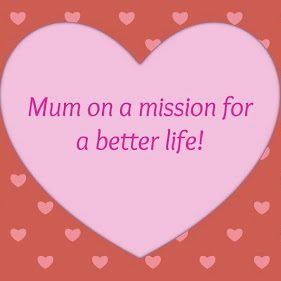 Did you make it to the end of this post? If you like it why not pin it for later reference? What is your favourite item on the list? I would love to hear your thoughts.